BY the Home Office’s own definition Sipho Sibanda and Hamdi Mahamed are destitute. As asylum seekers the two women are not allowed to work or access public funds including benefits – they survive only on what the UK Home Office provides and handouts from food banks. They live in accommodation in Belfast provided by private contractors on behalf of the Home Office and £37.75 a week for each person in their household to cover the cost of food, clothing, toiletries, electricity, heating and transport. For a mother-of-one that amounts to a weekly household income of £75.50 - the average household income after housing costs in Northern Ireland is £409 per week. But when both women, who are from Somalia and Zimbabwe, suffered the loss of a child in a country thousands of miles from home no government financial help was available. Asylum seekers are not entitled to a Funeral Payment, which supports people with low incomes towards the cost of a loved one’s funeral with an average payment of around £1,000. A Belfast-based housing group which campaigns to end destitution among asylum seekers, Housing4All, told The Detail that the Home Office’s current system was “callous” and was designed to “dehumanise and exhaust people who seek asylum”. The organisation has called for a review of the system. Although immigration policy is not a devolved matter, housing and health fall under the remit of the Northern Ireland Assembly. Currently all housing for asylum seekers in Northern Ireland is located in Belfast so, as citizens of the city, human rights organisations have been applying pressure to Belfast City Council and other statutory bodies to help relieve the financial burden on parents in the event of a child’s death. Belfast City Council last month agreed to waive cremation fees for all children in Northern Ireland up to the age of 17 and burial fees for children who were Belfast city residents; however, parents must still cover the cost of a grave which ranges from £287 to £595, plus any additional costs. For asylum seekers like Sipho and Hamdi cremation is not an option because of their cultural beliefs. The Detail spoke separately to the two mothers who were only able to bury their babies thanks to the financial support of their friends and the wider community. In May Sipho lost her baby daughter Amarah. Four days after her birth in a Belfast hospital she was diagnosed with Edwards Syndrome, a genetic disorder caused by a chromosome abnormality. She passed away aged seven months. “Although her life was short, she was loved,” said the grieving mother. Sipho, who also has a nine-year-old son who was born in her native Zimbabwe, has been living in Northern Ireland for three years. She is still in the asylum system. Under Home Office rules you must apply for asylum if you want to stay in the UK as a refugee. To be eligible a person must have left their country and be unable to go back because they fear persecution. Sipho told The Detail she could not have afforded Amarah’s funeral had it not been for the generosity of her friends and network of support; but even the cost of hosting those who called at her home to support her following Amarah’s death was a worry for Sipho who opted to bury her daughter the day after she died. Describing the experience of being unable to afford the cost of Amarah’s funeral as “undignified”, Sipho said: “The funeral was a short-lived tribute to Amarah’s life. “Asylum seekers are human beings and seeking asylum is not a crime. It’s not by choice people are here. If I had my choice I would be in my country. I would not leave my family. I would have wanted to have my baby in my country and to have buried her in my country. “If you get to the stage you have to bury a loved one, away from your family – if they [government] could just make it as easy as possible; if they could just make it as simple as possible I would have been able to bury my daughter with dignity. It was a similar experience for single mother Hamdi Mahamed, who arrived here in 2009 from Somalia where two of her daughters still live with Hamdi’s mother. She has not seen them in nine years. The baby the 32-year-old lost three years ago was also a girl; she named her Maryan. When a grieving Hamdi turned to the Home Office she was told no financial help was available for asylum seekers struggling to deal with the death of a loved one. 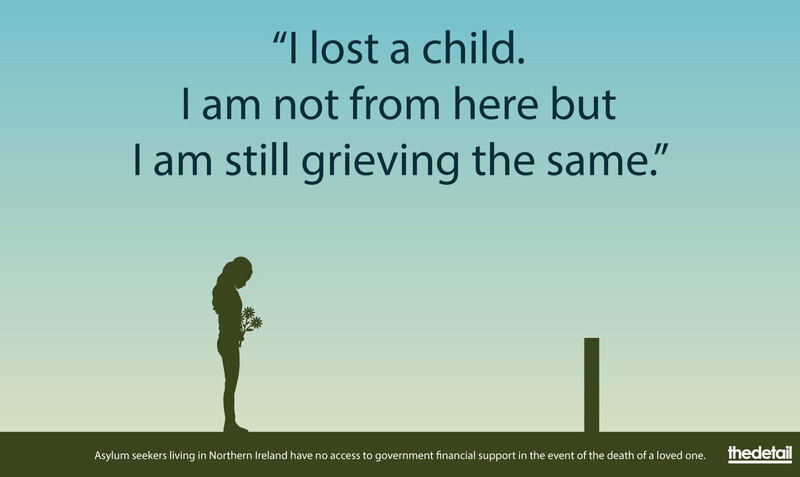 The cost of the average funeral in Northern Ireland last year was £2,982 so to be treated as an asylum seeker here applicants must be ‘destitute’ which means they are extremely poor and cannot provide for themselves. But the Home Office policy is that it does not make any contribution towards the cost of funerals of deceased asylum seekers or their families. When Hamdi notified the authorities that her baby daughter had died – not only was she refused support but she claimed she was initially asked to refund the maternity grant she had received to provide for her newborn. However, they didn’t enforce that decision. Hamdi’s daughter was stillborn in a Belfast hospital in January 2015 after she went for a routine check-up at 36 weeks and they couldn’t detect a heartbeat. “I went to the hospital for a scan; I did not think I would be leaving to put my baby in a grave,” explained Hamdi. Tragically, it took five days to bury the baby girl she named Maryan because Hamdi couldn’t afford the £800 cost. It was only through charity and the support of the local community that the funeral could go-ahead. “I asked for help....the Home Office said they couldn’t. “I stressed so much because I could not afford the funeral or to bury my baby. Without the kindness of the charities and Belfast Islamic Centre I would not have been able to do anything. “When someone dies, it’s outside your control. People seeking asylum can’t afford the money. I am just saying ‘please have a bit of compassion’ – even if they provided a grave; that would help. The Law Centre NI believes that the Stormont Executive’s Crisis Fund is one model that could be used to get around the inability of asylum seekers to access Funeral Payments. The Detail asked the Home Office why it does not offer financial assistance to asylum seekers who they define as destitute in the event of the death of a loved one and if they had any plans to review their policy. A spokesperson said: “The UK has a proud history of granting asylum to those who need our protection and we are committed to providing a safe and secure space for them. The Home Office refused to provide figures for the number of deaths of asylum seekers’ children in Northern Ireland. Local organisations working in the sector told The Detail there have been five deaths in the last four years. The Detail previously reported on death and dying in Northern Ireland and those stories can be accessed here.